The day started with the Super fast Ferry, a short 30 minute trip from Mykonos to Tinos. The afternoon sunshine was bright, it filled the sky and made the fall atmosphere feel perfect. 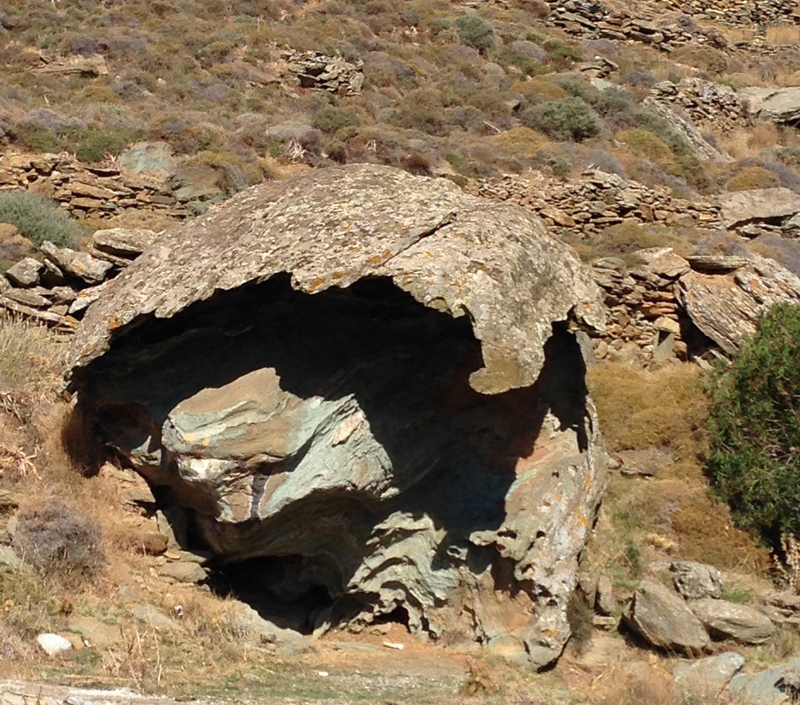 Tinos island has exceptional history, we somehow underestimated it, as we always travel by boat there. I always thought it was too religious with too much focus on pilgrimage. 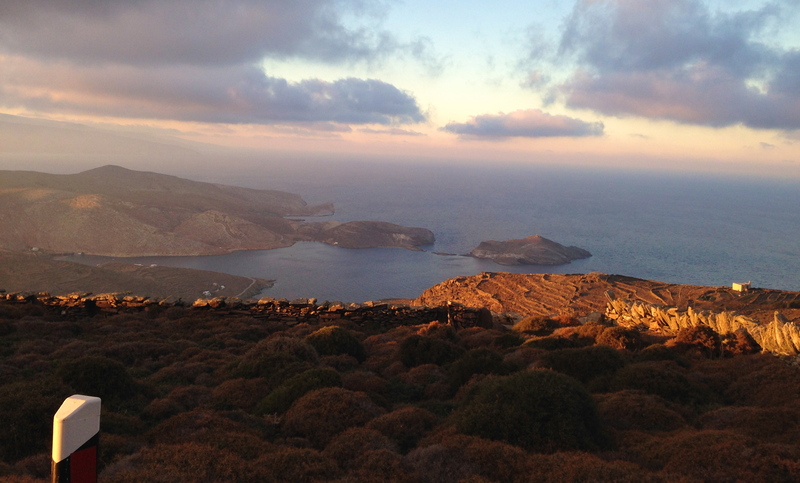 First of all, it is hard to imagine how beautiful Tinos is, unless you have driven the islands north shores. The south is pretty, beaches and restaurants with the town and the Monastery. But the north especially at this time of the year is exceptional. The light in the sky is scriptural, and the fresh brisk air makes it magical. 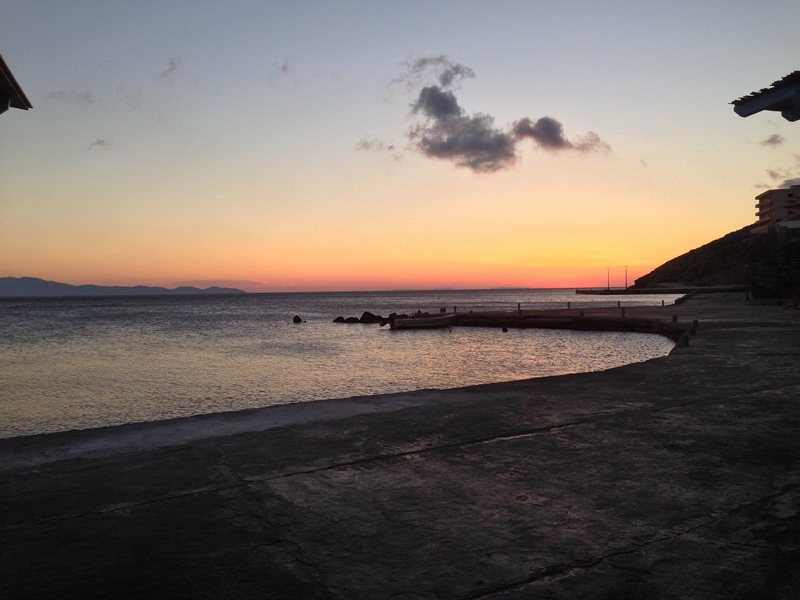 We left the Tinos port at 2h35 enroute to Adonia’s Mom’s home, where she grew up. 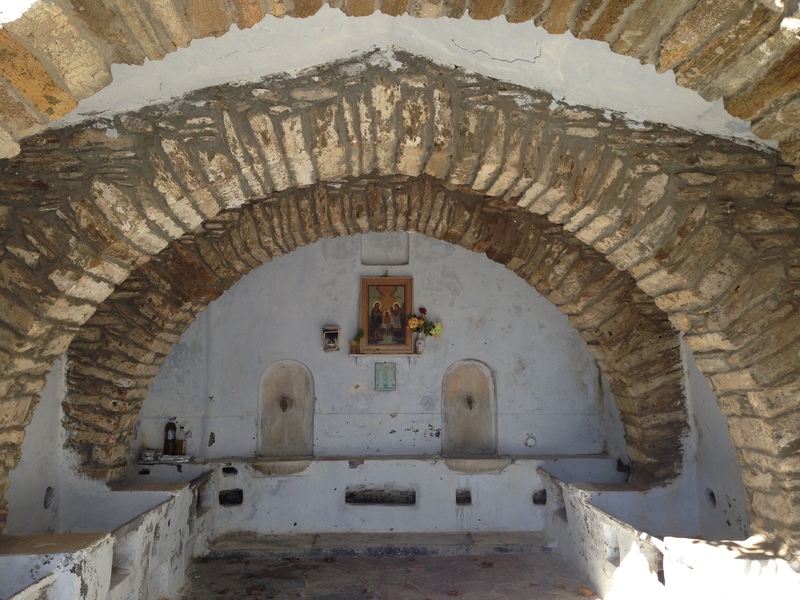 Now before I describe to you her village there are over 50 villages in Tinos. I ask myself, is that possible, and the answer yes, although many are not inhabited the way they were in the past. Her Mom’s village is very charming, we enter it by foot, the essentials are there; a church, a place to play for the kids and a central washing area for the women, see photo below. Thinking about how an island can have so many villages is puzzling, my wife asks Adonia, “how small are these villages”? She explains her story, when a person passes away in the village, an offering is made, in this case it was a coin she recalls. Her Mom gave 110 coins, so that explains the constitution of a village. From there we drove through the winding hills, up to a small village to visit their producer of tsipouro, a drink brewed from pressed grapes. This area of Tinos seems more agricultural and it non descriptive in a way, but still very charming. From there we passed the vineyards of a Tinos wine producer we enjoy. 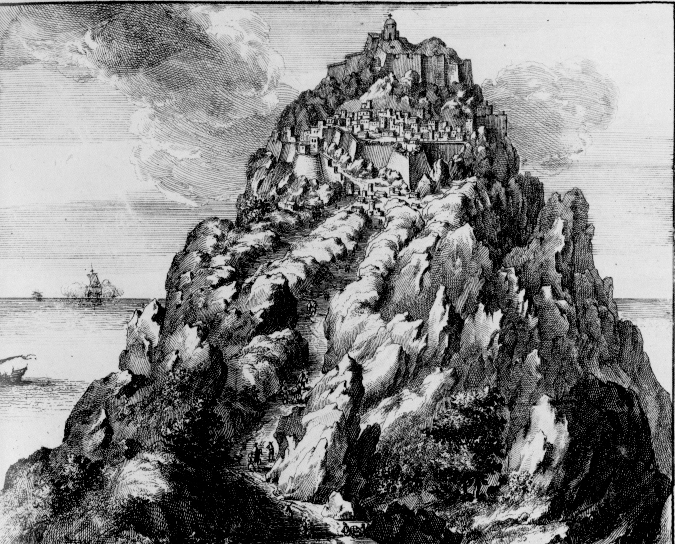 This is an illustration of the citadel on Tinos by Olfert dapper in 1703. The area Volax is to the north, has this almighty picturesque landscape, it is surreal with giant boulders some the size of buildings. The village of Volax lies at the center of this amazing landscape, and the town, small and charming. On our way there, we couldn’t help to be in awe from the landscape. The beauty of nature there is fabulous, it looks lunar. We stopped in Volax for a walk in the village. It was quiet and except for us, no one there. When I enquired how they survive, the reply was “pullman”. I have no idea what it meant ,until I thought about it. This village survives on tourist buses, and the taverna there serves the usual Greek Salad, etc. 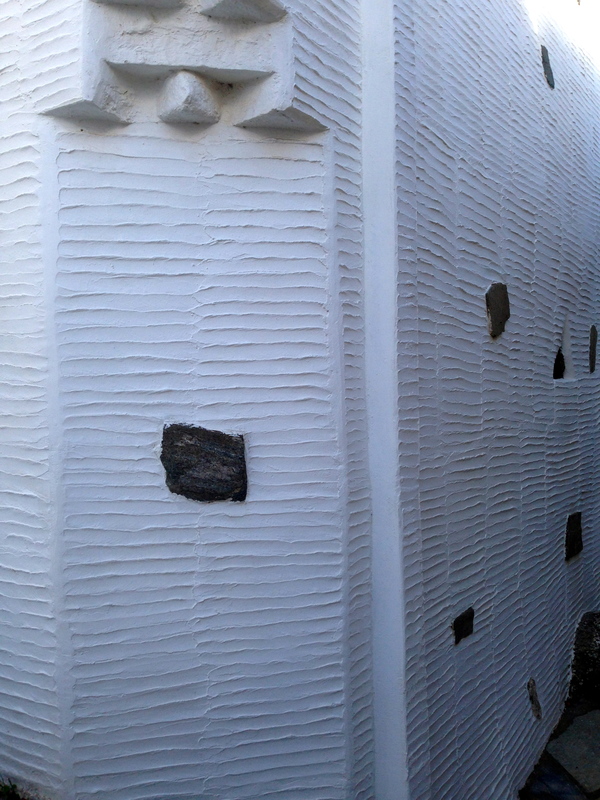 What caught in the village of Volakas our eye was the architectural finish to the exterior of the buildings. The sovas, in Greek “plaster” is referenced as “sardella”, it helps deflect light. To us it seems to be the Venetian influence that passed in the region. 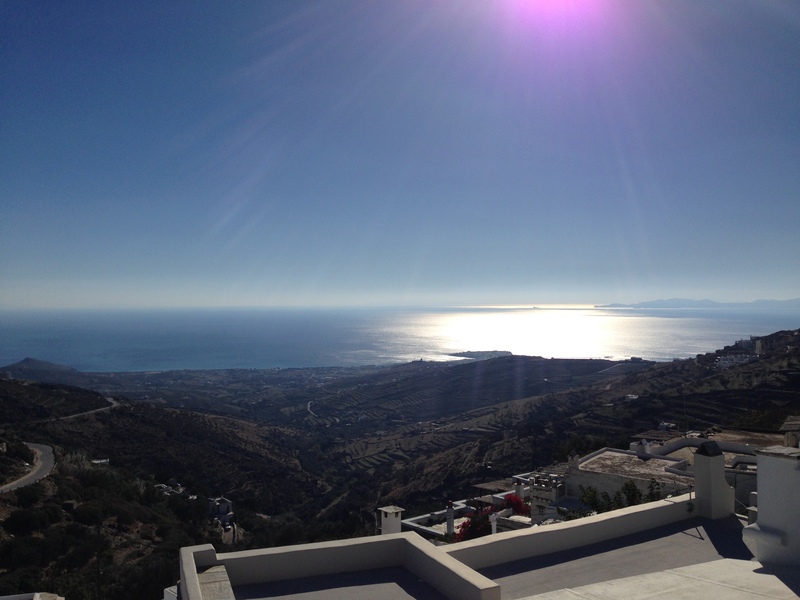 To the west, the mountains surrounding Pyrgos are full of some of the most beautiful green marble in all of Greece and deep valleys that fall into the sea. The light intensity casts a shadow that moves your eyes and soul. Ode to ToThalassaki, a heavenly place, the owners are hosts to our family. We finally make time in the off season, a few days before it closes, a quiet night, the sun sets, the sky is crimson, the air is filled with sea breeze. At night we were invited by Aris and Adonia, the owners to share in a family dinner. Our night was filled with numerous fall dishes we all enjoyed. The “sea is in the air” as we share sea urchin, squid, octopus, fish and fall garden vegetables. 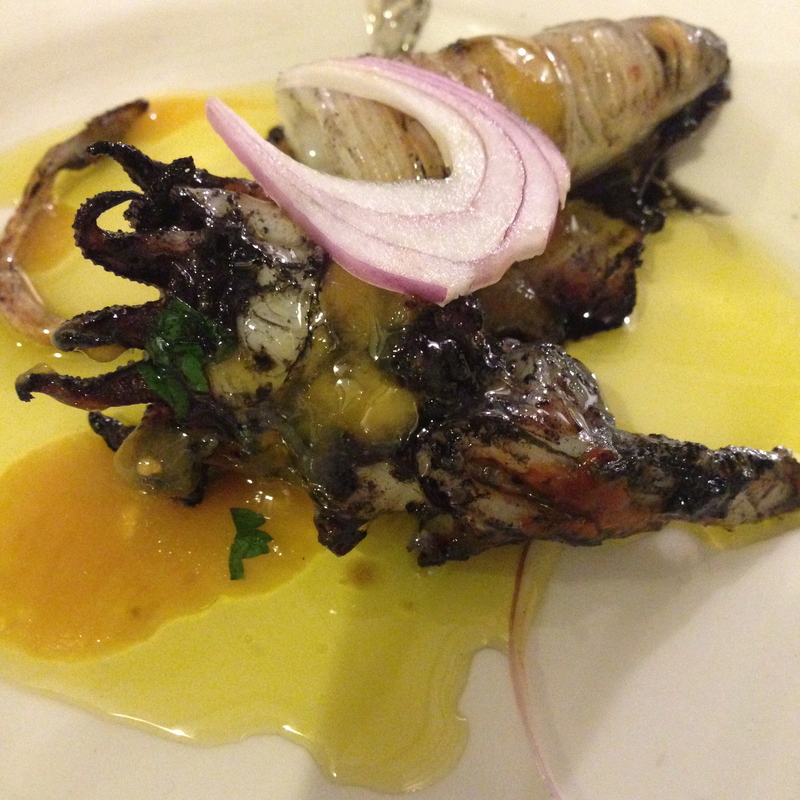 This is the octopus, slow cooked at 135°C for four hours, it was served with fresh red onion and olive oil and vinegar. 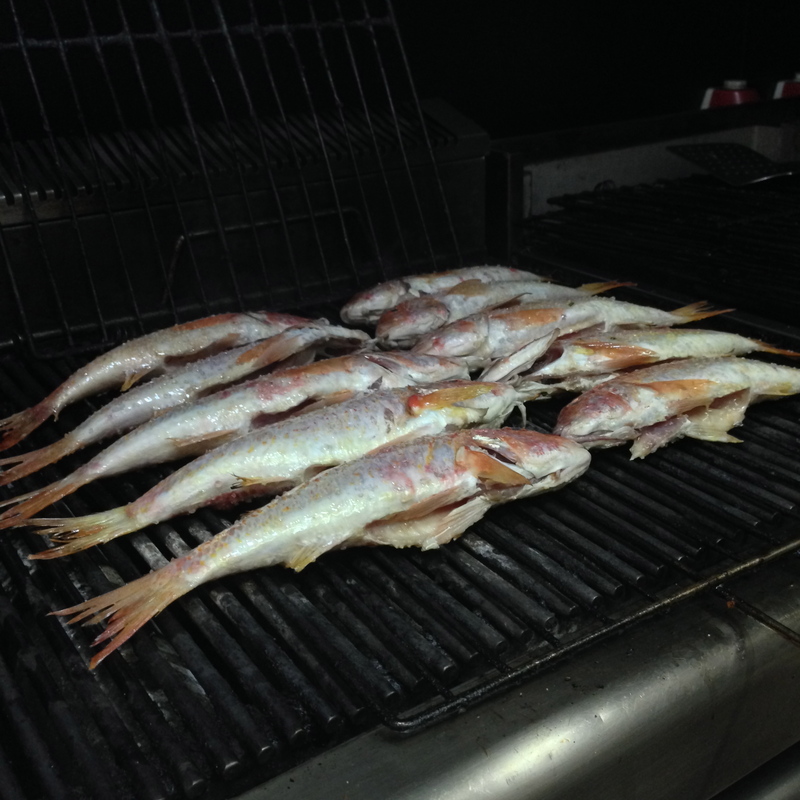 Barbounia the ultimate Greek fish, grilled to perfection by Martin, their in-house grilling specialist. These fish are the king of the sea, and when fried, or grilled many people enjoy the fighting the bones like a cat. There is no doubt that these fish taste better, (as many foods do) when you use your fingers. They are the finger licking good type. 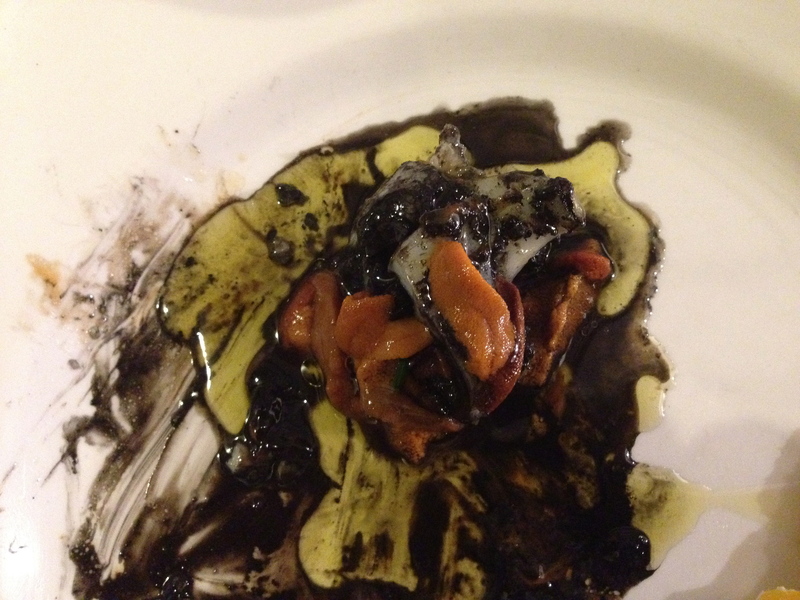 This dish was a combination of squid cooked in its own ink, then added atop is fresh sea urchin, some lemon and their house E.V. Olive Oil. 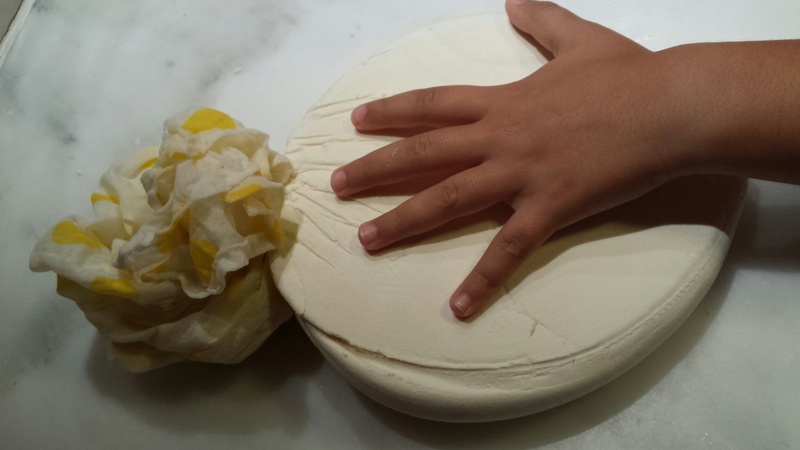 The fantastic fresh cheese made with local milk was one of the table’s favorites. 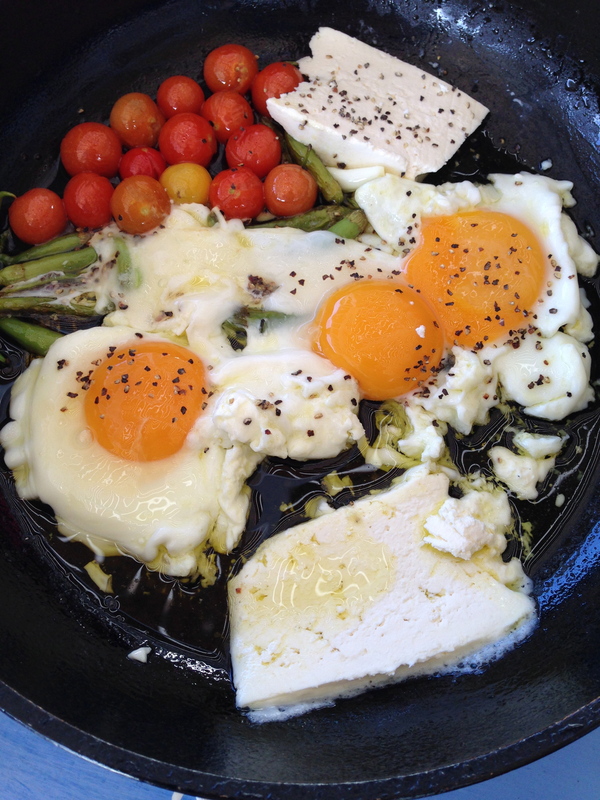 Creamy white accompanied the homemade bread, and helped for the following morning’s breakfast. It was strained overnight and then shaped with the help of Elisabeth. We cannot forget the next morning, the breakfast prepared by Aris, he is not a chef but he has damn good food sense. Aris flutters around more than I do in the kitchen, and he is a better chef. This was a trip that was planned for 7 hours and last a day and a half. If you go to Aegean, don’t miss Tinos island, and certainly do not miss ToThalassaki, the best restaurant all over the country!